"Abbreviated Development Plan, (U) AVRO Vertical Take-Off Aircraft, Weapon System 606A, USAF Contract# AF33(600)-39722, 26 June 1959, AVRO Aircraft Ltd, Malton, Ontario, Canada (NOTE: Although the 1958-59 re-direction of funds from this contract to help support the subsonic AVROCAR (USAF/Army Contract# AF33(600)-37496 development was detrimental, it should have nonetheless returned on-track by 3rd quarter 1960.) This program called for development and manufacture of a prototype weapon system resulting in first flight of a vehicle in the 2nd Qtr of 1964. the Category I and II flight testing should have been completed by late 1965. 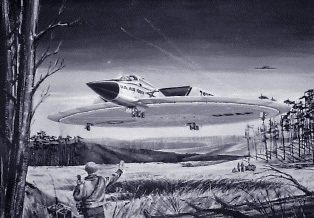 The Contractor's Estimate for the protype program was about 50 Million, and was to have provided 3 Supersonic Disc aircraft." 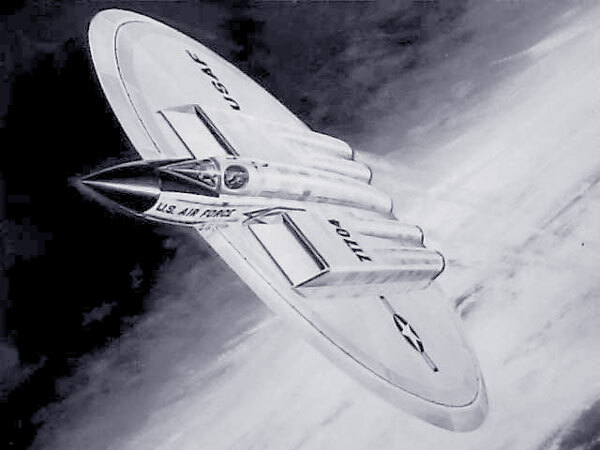 "I think that 606A did not refer to a specific design but rather a USAF requirement for a high speed fighter bomber. I say this because I have now seen three distinct "606A" designs in the reports that X has lent me. The first was a pure disk. It looks a lot like the Silverbug drawings you have. I now have several wind tunnel pictures of this design, but they have not been scanned in. The second appears to be the one I previously sent, with a fuselage with a cockpit forward of the wing. This also matches the artist drawings you sent me. This one was 35 ft long with a wing span of 29 ft. It is somehow powered by six engines. The final one is smaller version with only two engines and I think is the "final concept". I have attached a drawing of this vehicle. Part of the USAF 606A money was redirected to the Avrocar program. This may be why they went to a smaller design. It may also be that they went smaller due to cost and complexity. I have an analysis report! with only hand drawn sketches than indicates a vertical tail was included on later versions of this design." Speacial thanks to Blake William B.